In July, 2012, the Minister of the Department of Planning and Community Development announced a reform of the Victorian planning zones and has posted the details of the DPCD website. Interested parties (eg Councils, industry groups, community groups and individuals) were requested to review the proposed zones and make submissions by 21st September, 2012. Late submissions may be lodged up to 5.00 p.m. Friday 28th September, 2012. “Section 5 of this report which includes comments as well as possible unintended consequences will form the basis of Council’s submission to the Department of Planning and Community Development (DPCD)”. “that Council publish this submission as a discussion paper on Council’s website including providing and promoting a link to the DPCD contact details for the lodgement of submissions by residents. …. That this be on the alerts and be sent out as an alert as part of our electronic consultation trail”. The link to the submission (Glen Eira Submission Outline) is on the website and the alert was sent out on the 7th September, 2012. GERA has reviewed the proposed reform of planning zones. 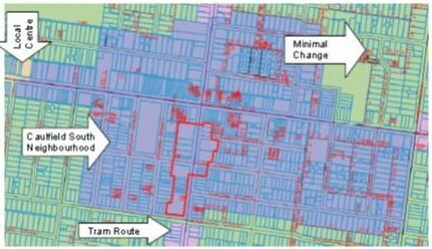 In general GERA supports the long overdue review of the zones, however, this support is not unqualified as GERA believes the current proposed residential zones (scheduled to be implemented in 12 months) and commercial zones (scheduled for implementation October, 2012) will have far reaching adverse impacts on the residents of Glen Eira. Grounds of appeal restricted by reclassification of previously not permitted or permit required land uses as right of use. (Places of Worship and Medical Centres in Residential Zones and being declared exempt from the planning controls applicable to the residential zone). Commercial/retail uses permitted in Residential Zones if the Residential Zone abuts an activity centre (within 100m). No limit on hours of operation and declared exempt from the planning controls applicable to the residential zone. While some of our more cynical members have suggested that loss of appeal rights would relieve them of the frustration experienced when their objections are ignored, GERA would argue that every resident has a right to express and have their opinions listened to. This right should not be able to be restricted because of a zone change. Reduction on lot sizes in zones will result in boundary to boundary double storey dwellings being built and have a negative impact on the character of the area (visual bulk, absence of landscaping) and residential amenity (overshadowing, overlooking). Encourages high density housing in centres without taking into consideration the future demands on aging and currently inadequate infrastructure (roads, public transport, sewers, utilities, police, hospitals and schools) of these centres. The current review relates to the zone proposals and the allowed uses within the zones only. The implementation process (i.e. how to) has yet to be defined and many details regarding overlays (Heritage, Neighbourhood Character) are yet to be defined. This restricts meaningful analysis of the new zones. The lack of information on the implementation of the zones also extends to the community participation/involvement in the implementation process. Height controls vary across the new zones (there are no height controls in the new Commercial Zone 1) and also vary in being mandatory or at the discretion of the local authority (Council). Therefore, the inclusion of extensive community participation (which zones were, defining the schedules/requirements) is imperative. GERA encourages residents to review both the Akehurst and GERA submissions, and if considered appropriate, make a submission to the DPCD. GERA notes that this Amendment was approved by Council at the 30th August, 2011, Council Meeting and has subsequently been submitted to the Minister of the Department for Planning and Community Development for approval to exhibit. Ministerial approval is pending. along all hard rail lines (i.e. train and tram lines) – at least to the property immediately abutting the hard rail line. Residents should therefore be extremely concerned about the interface between Housing Diversity/High Density Areas contained in Council Policy. Policies are guidelines which are referenced by the Planning Scheme. Policies proliferate in Glen Eira as they are seen as being preferable to Planning Scheme inclusions because they are easier to change+ – this is despite the fact that in its submission to the Independent Planning Panel on the C87 Neighbourhood Character Overlay Planning Scheme Amendment Council stated that “policy has generally been accorded little weight at VCAT”. To revert to discussing Amendment C90 – Transition sites in Housing Diversity Areas abutting a Minimal Change Area and how it addresses residents’ long outstanding issues with regards to the Housing Diversity/High Density Areas interface with Minimal Change Areas (ie visual bulk, solar access, traffic and parking, overlooking and noise). Amendment C90 was outlined in the Council Meeting Minutes of 30th August, 2011 – Section 9.4. Readers should also note that the policy states that “if approved it would still be (only) a policy and not a control”. 3. A transition site where the side of the property forms the boundary line. The policy also state that’s “In essence, the policy moves development further away from a minimal change area to reduce visual bulk impacts and increase the ability to incorporate canopy trees on a development site”. So how does it do this – the answer is simply setbacks, which Council now refers to as transition zones. 11.5 metres from the rear boundary so it would not be visible from the neighbour’s private open space in the adjoining minimal change area (measured at a distance of 4 metres from the rear fence line). 10m from the side boundary adjacent to the minimal change area. On a property of conventional width, it is acknowledged that a third level may not be feasible, given the required setbacks. GERA would like to go on to discuss how the ancillary issues of visual bulk form (i.e. those elements related to “respectful of the character of the adjoining minimal change area” – materials, eaves, roof pitch, landscaping, site coverage, proximity to property line) and residents’ other major issues (solar access, traffic and parking, overlooking and noise) are addressed in Amendment C90, however, we are unable to do so because the C90 Amendment does not address these issues. * Council Minute 4/9/2012, section 9.1 – the report relates to a 4 storey development on the Corner of Howitt and Balaclava Roads, Caulfield North. ** Glen Eira’s housing policies clearly define, through a boundary, areas where higher density residential developments should be channelled. These areas are typically around shopping centres and major public Transport nodes and routes. Housing Diversity areas contrast with Minimal Change areas. The Minimal Change area policy discourages development of more than two dwellings, and seeks to maintain the low scale character of traditional predominantly detached house suburbs. A Planning Scheme Amendment can be initiated by the Administration (with or without presentation at an open Council Meeting). The Amendment is submitted, with an explanatory note to the Minister of Planning and Community Development for approval to exhibit (i.e. present to all the parties who may have an interest in the amendment, or may be affected by it, for comment). If a submission opposing the amendment are received which Council is unable to resolve, Council may opt for an Independent Planning Panel (appointed by the Minister) to consider, and make a recommendation on, the amendment. Council is, not bound by the Independent Planning Panel’s recommendation – it may resolve to adopt the amendment, abandon the amendment or adopt the amendment with changes. Council’s resolution is then submitted to the Minister for approval and gazetted. The process is long – at least 18 – 24 months, whereas changing a policy is, in comparison, a hey presto alternative (no ministerial approval, limited community input).